Last 13th of March we had the enormous pleasure to have Dan Wood with us, giving a talk about the Discovery of the Kencana Au-Ag ore deposit in Indonesia. Dan Wood was the SEG Distinguished Speaker during 2018. He is an exploration geologist (nowadays retired) who was associated with a great number of significant ore deposits discoveries. Together with the Company's exploration team of the Newcrest, from which he was the Executive General Manager Exploration, they were judged by the Metals Economics Group of Canada to have been the world's most successful gold explorer, during a long period of time. The main topic of the talk was the Kencana Au-Ag ore deposit, in Indonesia. This deposit, together with other associated to the main one (Gosowong and Toguraci), is a good example of high grade, low-sulphidation epithermal Au-Ag mineralization. He explained his experience through the discovery, exposing all the analyses obtained with the exploration of each of the deposits. An important fact is that the Kencana deposit is about three times the size of both Gosowong and Toguraci deposits. Dan remarked the important role that perseverance during the exploration process, good field work and even serendipity played in the discovery of this deposits. We want to thank Dan Wood for such an interesting talk and for giving us the pleasure to hear his experience. 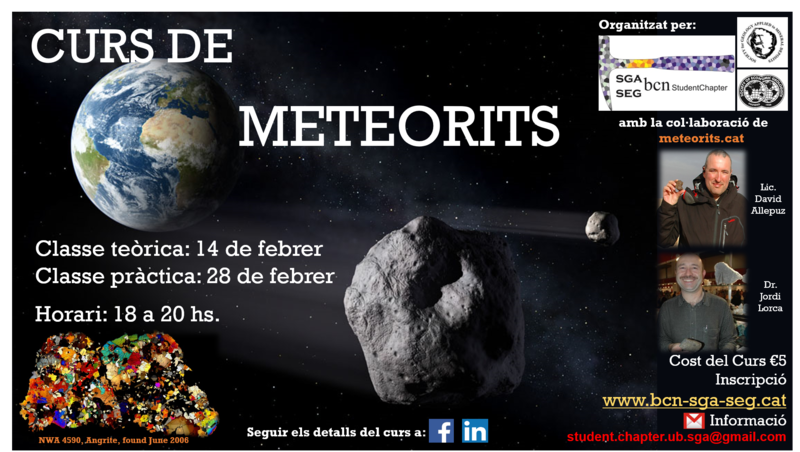 Last 14th and 28th of February took place the Meteorites Short Course organized by the Barcelona SGA-SEG Student Chapter and given by Dr. Jordi Llorca and David Allepuz at the Faculty of Earth Sciences of the University of Barcelona. First of all, we want to thank all participants: it was a great experience for us to organize this course and we received very positive comments from all the assistants. The course was divided in two days. The first day consisted in a theoretical session in which David Allepuz and Dr. Jordi Lorca introduced different terms related to the classification of meteorites and its characterization. They also detailed the procedure they follow in order to sample meteorites and explained their own experiences during the field trips around the world, as well as the excitement they still feel nowadays when they find a meteorite. A place where they usually find meteorites is the Atacama Desert, Chile. The way they did the conference was easy to follow, especially for those who didn’t have any knowledge about the topic. The second day of the course was for the practical session. 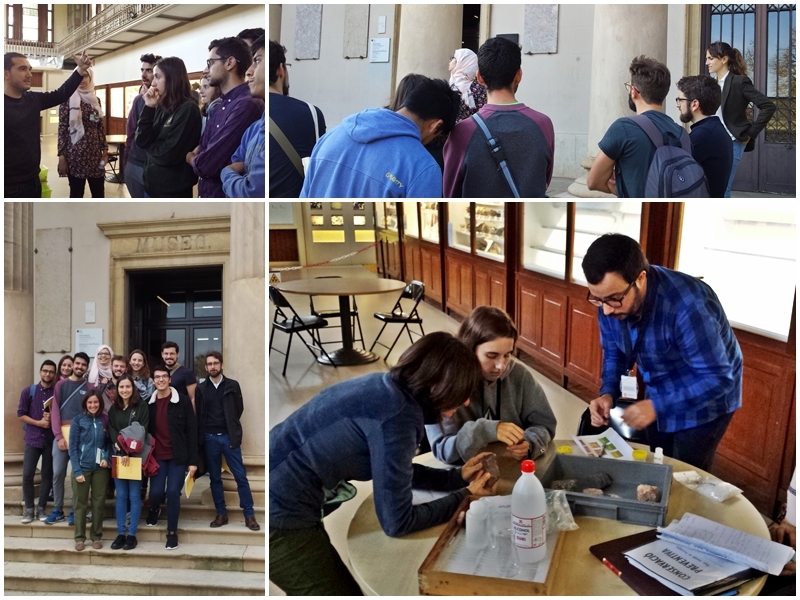 In this occasion, we had the chance to take a look at a great number of thin sections, corresponding to different typologies, with optical microscopy. This way it was possible to apply the terms we learned during the theoretical session for the description of the samples. The thin sections were part of the collection available at the Faculty of Earth Science of the University of Barcelona. The course participants exposed their opinions and said they found the course very interesting. However, they lament the lack of time provided to study the samples considering the amount of samples available. To conclude, we want to thank David Allepuz and Dr. Jordi Lorca for the interest and dedication they put to organize this short course. Last 7th of January, Carlos Alonso was invited to our 6th Informative Talk. Carlos Alonso is a senior geologist in exploration and mining, gave us the talk: La Experiencia de un Geólogo Modelador: Optimización de la información geológica mediante el uso de tecnologías avanzadas. The talk was divided in two parts. He first explained how he decided to study Geology and talked about his academic trajectory. He did his Geology Bachelor at the Universidad Complutense de Madrid and decided to direct his career towards mining. During his career, he got the opportunity to start learning softwares to perform 3D geological modeling and decided to specialize on that to apply it within the mining sector. Nowadays he works as Business Development Manager for Seequent, the company which provides the software Leapfrog (www.leapfrog3d.com/), in London (UK). 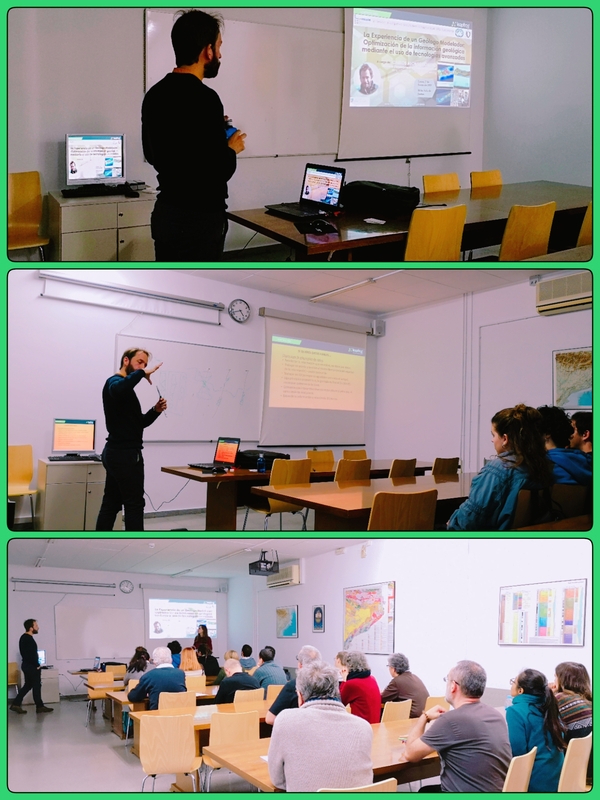 The second part of the talk was focused on the 3D modeling itself: the different tools it provides and how it can be used to improve and optimize the geological study of an area. He also provided several examples, mainly from South America where he worked for several years, showing its different applications within geology: from 3D mapping of geochemical anomalies within a mine pit, to locating the subduction zones in the Andes Mountains using the information from seismic lines. He concluded the talk making us aware that all geological data we might have can be modeled as soon as it can be codified and organized in a database. Moreover, any information contained within a database is better understood and can be better interpreted when we are able to easily visualize it, for instance using 3D modeling. Nowadays there are several softwares, like Leapfrog, that make 3D modeling much easier and friendly for all users and it is important for geologists to familiarize with them. 28th of february, 18h-20h: A practical part (samples under a microscope). Last 28th of November took place the 5 th session of Informative Talks organized by the Barcelona SGA-SEG Student Chapter. 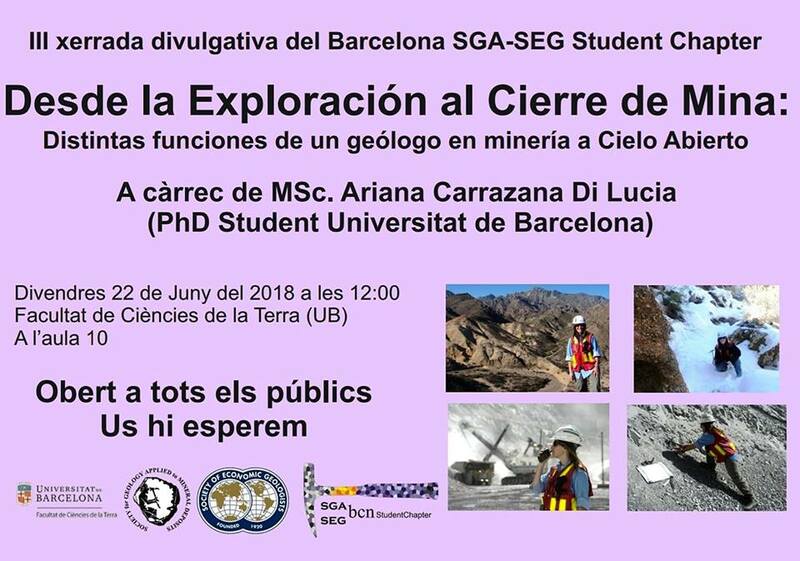 In this occasion, Àlex Sendrós presented the talk “Mineria de la potassa a Catalunya: El paper del geòleg en l’obtenció d’una relació sostenible amb l’ambient” (“Potash mining in Catalonia: The role of the geologist to obtain a sustainable relation with the environment”). 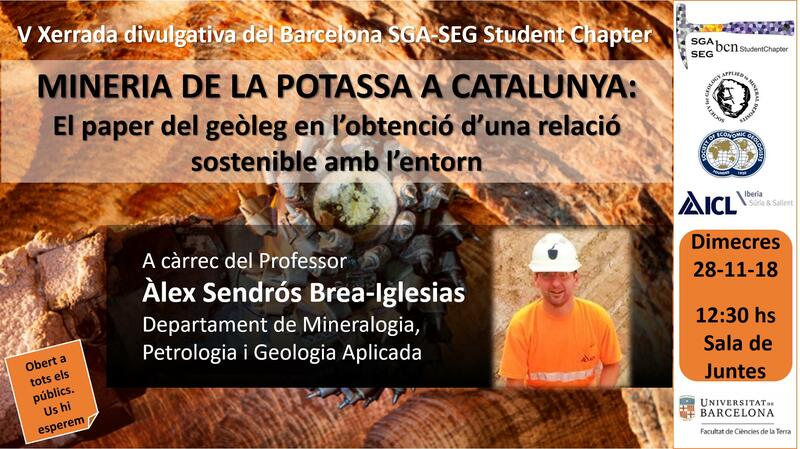 Àlex Sendrós works as an associate professor at the Faculty of Earth Science of the University of Barcelona and also in the Environment Department in the mining company Iberpotash-ICL Group in Súria and Sallent, in Catalonia (http://www.icliberia.com/?lang=en), since 2015. 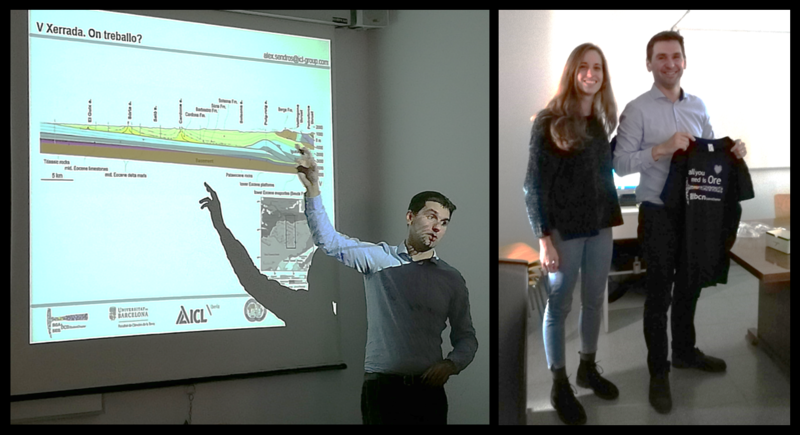 Àlex talked about his personal experience as a Geology student and how he started working for Iberpotash-ICL Group. He talked about his work in the mine and the different protocols they developed in order to avoid contamination from the mining wastes. His talk was very clear and informative. At the end of the talk the audience asked several questions both related with the mining activities and his job as a geologist in the company, and with the experiences and decisions he made as a student. Àlex ended the session encouraging undergraduate students to travel and learn from different geological and social realities. We would like to thank Àlex for participating in our Informative Talks sessions. 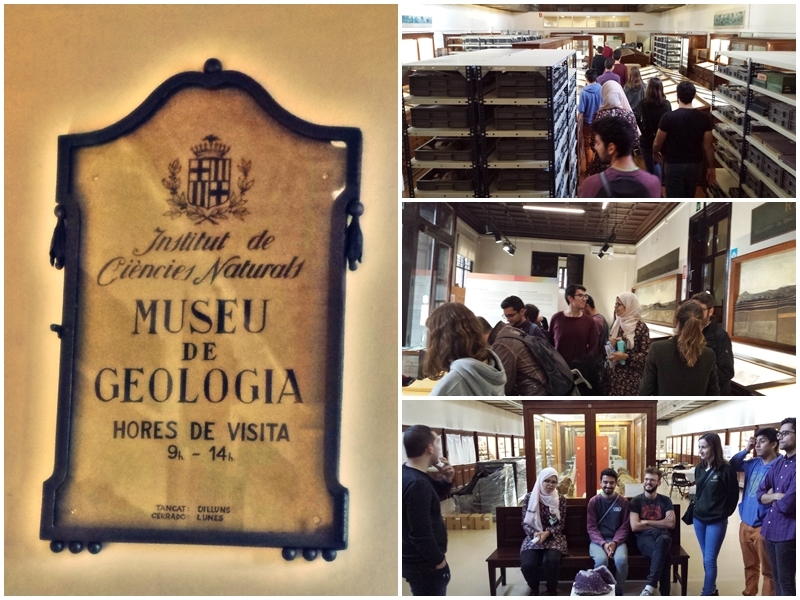 Last 22 nd of November, we visited the Martorell Museum, which is part of the Natural History Museum of Barcelona. 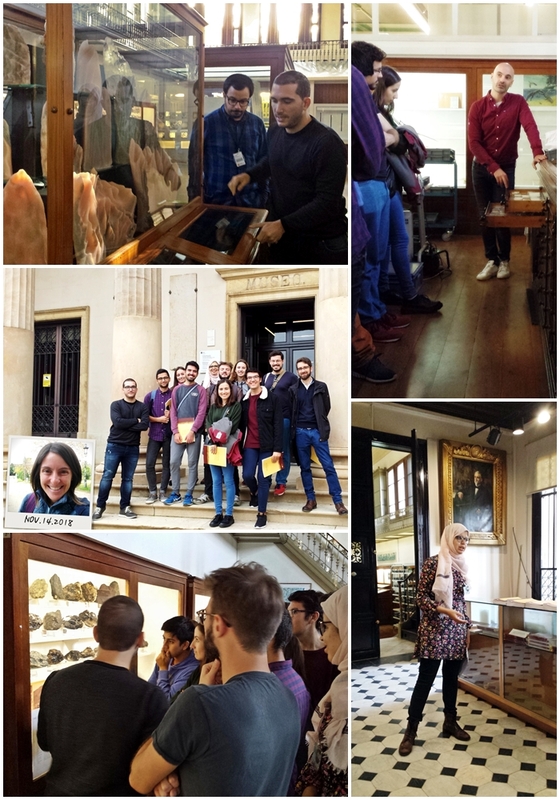 We were received by Yousra Haddad Belfkih, member of our Student Chapter, together with Yael Díaz, Marc Campeny and Vicent Vicedo, who are responsible for the petrological, mineralogical and paleontological collections. Yousra is doing an internship at the Museum documenting the petrological collection. To start the visit, they told us that the Museum was built thanks to the legacy that Francesc Martorell i Peña (1822-1878) left to the city of Barcelona in 1878. The Museum has been exclusively dedicated to geological collections since 1924. Then we were able to visit all the facilities. First, Vicent talked about the amount, storage and selection of the paleontological pieces. With Marc, we learnt about the preservation of geological samples and some important safety aspects during the conservation process. Finally, Yael showed us the library, which is specialized in the scientific disciplines of the Museum, the petrography laboratory, and how the team works with historical databases in order to adapt them to new technologies: http://www.bioexplora.cat/ncd/. We also did a small practice cataloging rocks and minerals under the guidance of David Fernández. 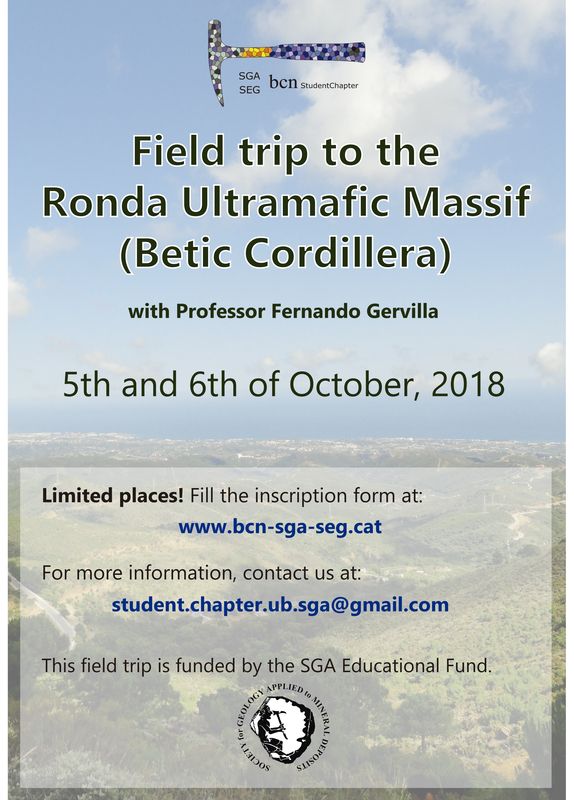 This year, the Barcelona Student Chapter organized a field trip to the Ronda ultramafic massif (Betic Cordillera) as its main activity. The field trip took place 5 th and 6 th of October. 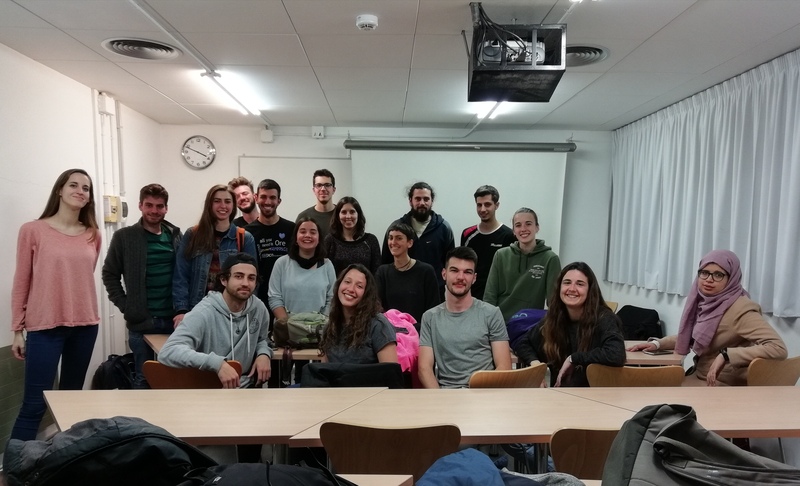 The participants were 10 students (bachelor, master and PhD students) from Barcelona Student Chapter (including people from the University of Barcelona and the University of Granada) and the Prague Student Chapter. The field trip was led by Prof. Fernando Gervilla, full professor at the University of Granada, who was accompanied by Dr. José María González- Jiménez, from the University of Granada, and one of our advisors, Dr. Joaquín A. Proenza, from the University of Barcelona. In this field trip, we were able to observe the different lithologies form the ultramafic massif of Ronda and the associated magmatic mineralizations. The lithologies consist mainly of lherzolites and harzburgites with minor dunite and pyroxenite layers. They represent a portion of subcontinental lithospheric mantle tectonically emplaced on Paleozoic metasediments during the Alpine orogeny (20-22 Ma). Three main domains are observed in the peridotites: i) spinel ± garnet tectonic domain, ii) granular peridotite domain, and iii) plagioclase tectonic domain. Regarding the magmatic mineralizations, they are spatially distributed according to the zoning of the massifs. We visited some outcrops of podiform chromitites within refractory peridotites in the plagioclase tectonite domain. The chromitites occur as small lenses, entwined veins or schlierens. These Cr ores contain up to 9 ppb Au and 2 ppm PGE. Some pictures of the most interesting outcrops we visited during the fieldtrip are here below. The field trip was a very good opportunity to understand and correlate the tectonic evolution of the ultramafic massif with the genesis of different types of magmatic ores. We would like to thank Professor Fernando Gervilla for sharing his knowledge and passion for the Ronda Massif. 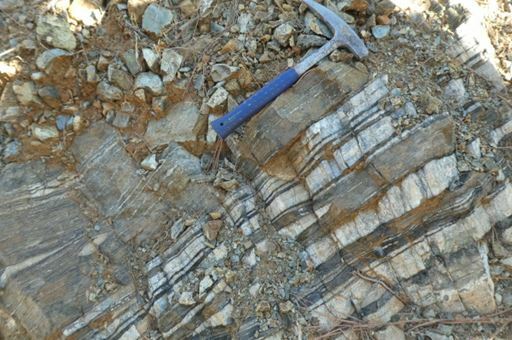 Exceptional outcrop where a layering of serpentinized peridotites (black) and pyroxenites (white) is observed, corresponding to garnet-lherzolites. The participants observing an outcrop of foliated peridotites. Granular peridotites outcrop. It the upper part it is possible to observed an isoclinally folded pyroxenite vein in the granular non-deformed peridotites. Participants of the fieldtrip in the Arroyo de la Cala chromitite outcrop. Chromitite outcrop in the Arroyo de los Caballos area. The Barcelona Student Chapter announces with great sadness the passing of our Honorific Advisor Antonio Arribas, at age 95, on the 27th of March, 2018. Antonio Arribas obtained the degree of Natural Science in 1948 and afterwards he graduated in Economic Geology in the Universidad Complutense de Madrid. He was the founder of the Crystallography, Mineralogy and Ore Deposits department of the University of Salamanca in 1965, the first official Ore Deposits department ever settled in the Iberian Peninsula. 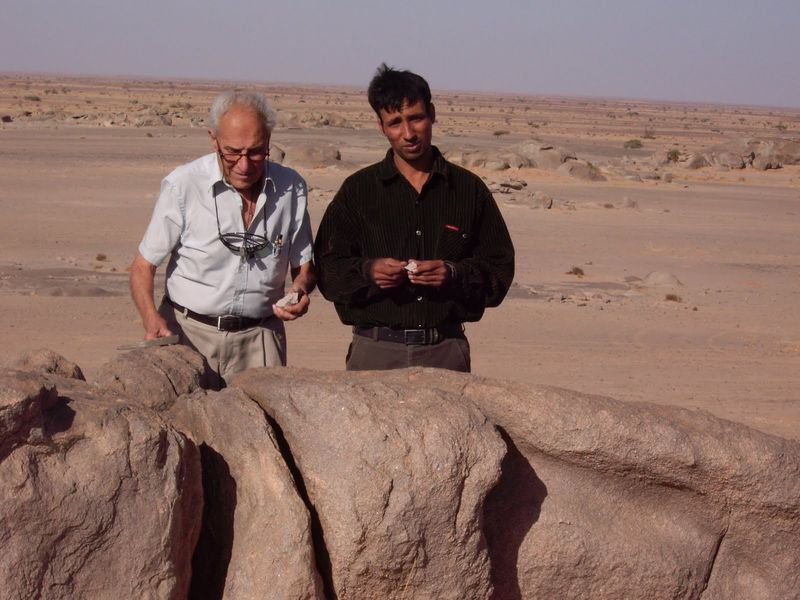 He was one of the fathers of Ore Deposit research in the Iberian Peninsula and other territories such as the Western Sahara. We would like to express our condolences to the relatives. ANOTHER DOCTOR IN OUR STUDENT CHAPTER!